We are used to compromises when it comes to small mini-PC’s but the Zotac Magnus EN970 is a mini-PC that gets almost everything right. It might be a bit bigger than some other mini-PC’s but the flat shape and form is perfect as it does not feel especially big. It offers a lot of storage options which is impressive since again it is a mini-PC. The 4 HDMI-ports might be overkill but it will allow you to connect more than one screen to the computer. From a performance standpoint we cannot complain. It performs very well, especially at 1920x1080p-resolution, the sweet-spot for this PC, and makes it a very viable gaming machine for your TV. Add Steam Home Streaming and, if you got an Xbox One somewhere else in the house, Xbox One to Windows 10 game streaming, and you have an very capable mini-PC that can play all sorts of games. In the end we find the Zotac Magnus EN970 being a well rounded mini-PC with great performance in every aspect. The Zotac Magnus EN970 also impresses us as a media playback machine. Since it is a Windows machine it can basically play anything as long as you have the correct codecs installed. The only fly in the soup is the price. This is a pricey mini-PC ($799 from Amazon) without memory or storage. However, when you start comparing it to other small PC-solutions you start to realize that the price is not that bad at all. For example the Gigabyte Brix with a GTX760 costs the same or even more. And while you can get a Intel Nuc or similar mini-PC, even from Zotac, cheaper it does not offer the same features and performance. 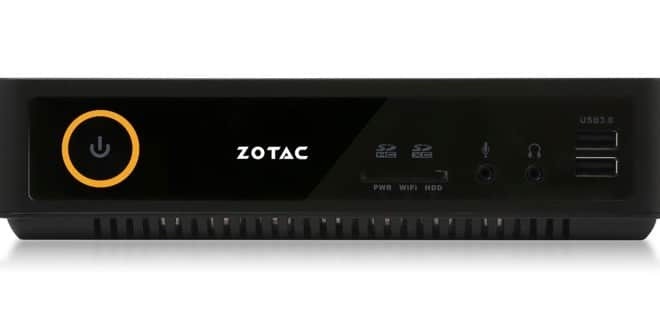 If you only need a small PC to play back media then a Intel Nuc, a Nvidia Shield TV or similar option might be a better choice but as soon as you want to be able to do more the zotac Magnus EN970 is there for you. Does not run too hot. 4 HDMI-ports? We would have loved a DP-port. Slightly weak CPU compared to the GPU affecting CPU-heavy games more.